Alex Jones, host of his own radio show, The Alex Jones Show, and known for his outlandish conspiracy theories, claims that he has personal knowledge that brain farts are not only a real medical condition, but they can be extremely dangerous. “I have had several very close calls with brain farts just in the past two weeks,” said Jones, while commenting on his recent appearance on Piers Morgan Tonight. After the second click, Alex Jones said, he pulled the gun down from his head and said out loud, “brain fart!” — feeling quite perturbed as he realized all he had to do is look in the chamber. 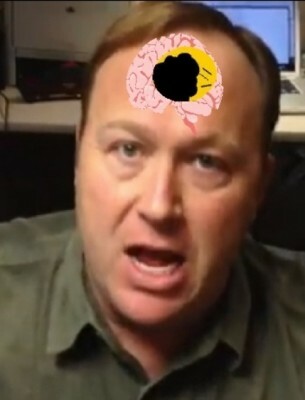 Alex Jones claims that most of his brain farts are pretty innocuous, but that they are getting worse and worse, and he blames them on secret medical experiments the Keebler elves are conducting on him in his sleep. “You know, I’m thinking of saying one thing, and end up saying another. That happens quite often with me,” he admitted. We couldn’t agree more. Jones was then asked exactly why he believes brain farts are true medical conditions, but he couldn’t really come up with anything. True to form, however, Jones claimed it was a trick question, but then proceeded to make up this response. Jones then cut the interview short saying that the aluminum foil jockey shorts he was wearing to protect his testicles from the microwaves being emitted from the small microphone “they” insisted he wear were beginning to chafe him, and he immediately left the studio.